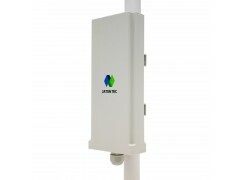 JATONTEC 4100P is a cost effective 4G LTE outdoor CPE product designed to enable quick LTE fixed data service deployment to the remote customers. It provides high data throughput and networking features to end users who need both bandwidth and quality service in the remote area. JT4100P is a very cost effective outdoor data CPE based on the standard implementation of LTE release 9 specifications (CAT5 capable). It is able to meet the most demanding requirements from large service providers with high throughput and availability. With high gain directional patch antenna, JT4100P enables a longer reception range from the base station. This yields more efficient use of the network with a larger cell reach, guaranteed carrier class service, and customer service probability. The device has one PoE enabled data port and a simple software firewall for security, providing an effective all-in-one solution to remote enterprise or home networking needs. Factors such as integrated design, low power consumption, high antenna gain and improved heat dissipation designs further improve the operational life span of this device. JT4100P is a user-friendly LTE CPE, and very easy to install and maintain. Easy and simple installation for non-professional user delivers instant broadband anywhere. Subscribers can just connect the device to their computer or home switch/router and the device is ready to offer an experience of surfing over Internet. The LEDs on the JT4100P have also been designed for user convenience, and offer a clear sign of what the device is doing. The compact design is well suited for enterprise and residential home use in the outdoor environment. The IP addresses can be statically allocated or dynamically obtained via DHCP. JT4100P offers rich management features to facilitate the task of service provider. It supports local management access, Telnet, WEB, and centralized remote OTA configuration, upgrades management and device monitoring via standard TR-069 ACS systems. JT4100P is fully compliant to the LTE Release 9 specification. It offers standard support for 4G features such as MIMO and MCS to maximize the system capacity and bandwidth throughput. The use of OFDM modulation enhances performance in NLOS conditions to ensure immunity to interference and multi-path conflicts typical of deployments in densely populated urban areas. Sophisticated QoS capabilities ensure true end-to-end QoS and support for high quality data services. JT4100P has built-in router function and VPN client support to provide greater service flexibility and reliability. The standard PoE support, easy-to-read signal strength and data activity indicators in the back panel make it intuitive for users to install and check the status of the device. The product is designed to operate in stringent outdoor environment and meets IP67, lighting and input power surge protection requirements. JT4100P come with different sub models to operate in different frequency bands as specified by the LTE standards. The currently supported product bands include B3, B7, B38, B40, B41, B42/43, B55 (3.3-3.4GHz).